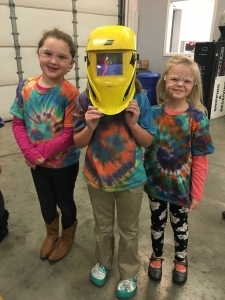 Brownie Troop 44505 invaded KC Robotics last night for a Girl Scout “Take-over”. 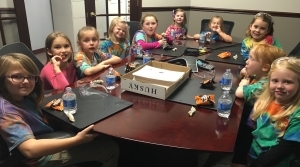 The troop from Colerain Township is a combination of Daisy and Brownie scouts. After a tour of the KC Robotics’ facility and viewing two robots in action, the girls learned how to program a robot. 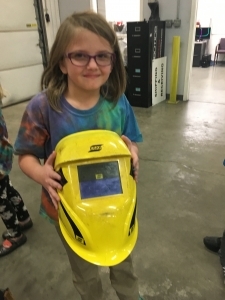 In addition to the simple programming lesson, the Brownies learned about robot vocabulary, safety rules (including welding helmets) and robotic tooling. They were curious about everything! The scouts are working on the Brownie Robotics Badge. Requirements include learning how to program, building a robot prototype and learning about robotics competitions.